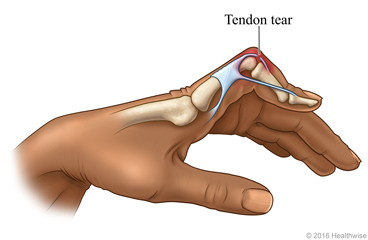 Surgery for a boutonniere deformity is done to repair a tendon in your finger so that you can move the finger more normally. A boutonniere (say "boo-tuh-NEER") deformity is an injury to the tendon that runs over the middle joint of a finger. The injury causes the middle joint to bend down and the end joint to bend up. After surgery, your finger may be sore for a few weeks and stiff for a few months. It may be in a splint to protect it as it heals. Wear the splint exactly as directed. Do not remove it until your doctor says that you can. You may be referred to rehabilitation or hand therapy. You may wash your hands and shower after 2 or 3 days, if your doctor okays it. Pat the incision (the cut the doctor made) dry. Do not soak your hand (for example, when taking a bath) for about 2 weeks, until your sutures are removed, or until your doctor tells you it is okay. Put ice or a cold pack on your hand for 10 to 20 minutes at a time. Try to do this every 1 to 2 hours for the next 3 days (when you are awake) or until the swelling goes down. Put a thin cloth between the ice and your skin. Prop up the sore hand on a pillow when you ice it or anytime you sit or lie down during the next 3 days. Try to keep it above the level of your heart. This will help reduce swelling. Enter B229 in the search box to learn more about "Boutonniere Deformity: What to Expect at Home".